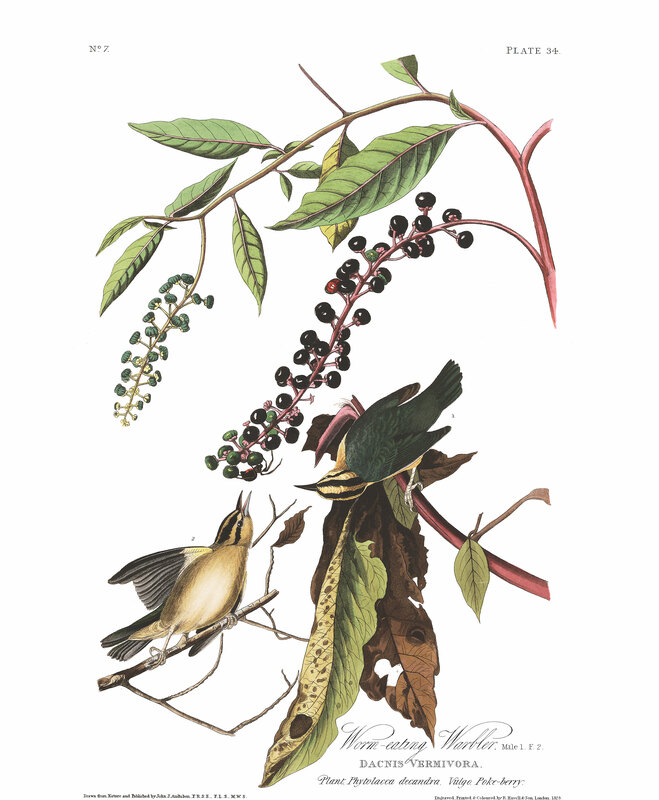 The nest of this active little bird is formed of singular materials, being composed externally of dried mosses and the green blossoms of hickories and chestnut-trees, while the interior is prettily lined with fine fibrous roots, the whole apparently rather small for the size of the occupants. About the middle of May the female lays four or five eggs, which are cream-coloured, with a few dark red spots near the larger end, leaving a circular unspotted part at the extremity. The nest is usually placed between two small twigs of a bush, not more than eight or nine feet from the ground, and sometimes only four or five. The flight of the Worm-eating Warbler resembles that of the Crested Titmouse, being of short duration, and accompanied with the same rustling noise, which is occasioned by the rather concave formation of their wings. It merely passes through Louisiana in spring, appearing there as early as the beginning of April, and extends its migrations to the borders of Lake Erie, where I shot several in autumn. It is probable that it proceeds farther north. It returns through Louisiana about the end of October, only remaining a few days on its passage. It is an inhabitant of the interior of the forests, and is seldom found on the borders of roads or in the fields. In spring they move in pairs, and, during their retrograde marches, in little groups, consisting each of a family, seven or eight in number; on which account I am inclined to believe that they raise only a single brood in the year. They are ever amongst the decayed branches of trees or other plants, such as are accidentally broken off by the wind, and are there seen searching for insects or caterpillars. They also resort to the ground, and turn over the dried leaves in quest of the same kind of food. They are unsuspecting, and will suffer a person to approach within a few paces. When disturbed, they fly off to some place where withered leaves are seen. They have only a few weak notes, which do not deserve the name of song. Their industry, however, atones for this defect, as they are seen continually moving about, rustling among the leaves, and scarcely ever removing from one situation to another until after they have made a full inspection of the part in which they have been employed. This species reaches the Central Atlantic Districts in the middle of May, and breeds there, as well as farther northward. I have found them more numerous in the Jerseys than in any other portion of the Union. In Kentucky and Ohio I have seen only a few of them; nor have I ever found their nests in either of these States. According to Dr. RICHARDSON, this species visits the Fur Countries, where a single specimen was produced at Cumberland House, on the banks of the Saskatchewan. It is found in the State of Maine, and in the British Provinces of New Brunswick and Nova Scotia, but I did not meet with it farther eastward. None were seen on the Rocky Mountains, or about the Columbia river, by Mr. TOWNSEND. My friend Dr. BACHMAN says that it breeds sparingly in the swamps of Carolina. He observed a pair followed by three or four young ones nearly fledged, all of which already exhibited the markings on the head. The eggs of this species measure five and a half eighths of an inch in length, and half an inch in breadth; the smaller end is rather rounded; its colour and markings as already described, though I have seen some more copiously marked than others, and the cream-colour of their ground tinged with a rosy hue. The plant on which you see a pair of Worm-eating Warblers is well known throughout the United States by the name of pokeberry. It grows in every situation, from the tops of the most and mountain-ridges to the lowest and richest valleys; and it is almost impossible to follow a fence for a hundred yards without seeing some of it. Its berries are food for numerous species of our birds, and produce a beautiful dark crimson juice, which is used instead of red ink by some of the country people, although it does not retain its original colour for many days. This plant grows to the height of four or six feet, and is eaten when it first shoots from the ground as a substitute for asparagus, quantities of it being not unfrequently exposed in the markets. The juice of the berries is taken in cases of ague and continued fever, but requires to be used with judgment, as too large a dose proves deleterious. The roof of the mouth is flat and slightly arched, posteriorly with two ridges, anteriorly with a middle prominent and two very slight lateral ridges; its width 3 1/2 twelfths. The tongue is 5 twelfths long, emarginate and papillate at the base, narrow, tapering, thin, concave above, the tip rather abrupt, and terminated by several stiffish bristles, like that of a Titmouse. The oesophagus is 1 inch 9 twelfths long, its greatest width 3 twelfths. The stomach is small, elliptical, 5 1/2 twelfths long, 4 1/2 twelfths in breadth; the lateral muscles moderate, the lower very thin; the epithelium longitudinally rugous. The stomach is filled with insects. The intestine is 5 1/4 inches long, from 1 1/2 twelfths to 1 twelfth in width. The coeca are 1 1/2 twelfths long, and 1/4 twelfth wide; their distance from the extremity 7 twelfths. The trachea is 1 inch 7 twelfths long, flattened, 1 twelfth broad at the upper part; the rings about 70, moderately firm; bronchial half rings about 15; the muscles as usual. WORM-EATING WARBLER, Sylvia vermivora, Wils. Amer. Orn., vol. iii. p. 74. SYLVIA VERMIVORA, Bonap. Syn., p. 86. WORM-EATING WARBLER, Sylvia vermivora, Aud. Orn. Biog., vol. i. p. 177;vol. v. p. 460. Bill longish, nearly straight, rather strong, elongated-conical, as deep as broad at the base, with sharp, nearly straight edges. Nostrils basal, oval, half concealed by the feathers. Head rather large, neck short. Body short and full. Feet of ordinary length, rather slender; tarsus compressed, covered anteriorly with a few long scutella, acute behind, longer than the middle toe; toes scutellate above, free; claws arched, slender, compressed, acute. Plumage blended, soft and tufty. Wings of ordinary length, considerably curved, the second quill longest, the first little shorter. Tail rather short, a little rounded, of twelve rather narrow, obtuse feathers. Bill blackish-brown above, greenish-grey beneath. Iris hazel. Feet flesh-colour. General colour of the upper parts deep green, tinged with brown. Head and lower parts light brownish-yellow, the former with four longitudinal black bands, of which one on each side proceeds from the middle of the upper mandible, the other from the inferior angle of its base. The lower part of the neck anteriorly, and the fore part of the breast are more yellow than the rest of the under parts; the abdomen and under tail-coverts nearly white. Length 5 1/2 inches, extent of wings 8 1/2; bill along the ridge 7/12, along the gap 3/4; tarsus 5/6, middle toe 3/4. The female hardly differs from the male in external appearance. THE AMERICAN POKE-WEED. PHYTOLACCA DECANDRA, Willd. Sp. Pl., vol. i. p. 322. Pursch, Fl. Amer.,vol. i. p. 324.--DECANDRIA DECAGYNIA, Linn.--ATRIPLICES, Juss. This species is distinguished by its elliptico-lanceolate leaves, and decandrous flowers, the other species differing in the number of stamina and one of them being dioecious. The berries, which are nearly globular, are disposed in an elongated, pendulous raceme, and are of a purplish-black colour. The flowers are white, their peduncles, partial and general, of a bright carmine-purple colour.